One of my fondest memories in while submerged in waters of the Northwest was an encounter with an angel. I was snorkeling around San Juan Island when I shifted my focus from the awesome seaweed and invertebrate life on the rocky outcrop, to the plankton mere inches in front of my face. There floated one of the loveliest and most graceful creatures I had ever encountered (it would be a few years yet before I cast eyes upon my wife). 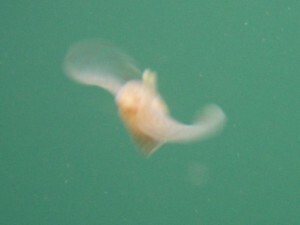 The sea angel (Clione limacina) gets up to 3″ long, though the one I shared the water with was smaller. During late winter, sea angels populations can explode in the plankton, though chance encounters can happen any time. It seems I’m not the only one smitten with Clione. It has apparently reached cult status in Japan where sea angel figurines have even been packaged and sold with beer. Of course, Clione‘s not the only angel in the plankton. Sea angels actually like to eat sea butterflies (Limnacina helicina). In fact, the sea angel’s species name is the same as the sea butterfly genus (limnacina). This is one of the many cases where taxonomists (people who identify things) name name creatures in a way that tells us something about them or their relationship to their environment. stringing up mucus nets 4 times their size to capture tiny copepods and other microscopic plankton. When the net is full, they reel it in, gobble it up and spit out a new one. While on the Bremerton Marina docks recently, I was able to get a few blurry shots of a winged sea slug (Gastropteron pacificum). It only reaches half the size (1.5″) of a large sea angel, but is such a pleasure to watch swim. It’s opaque, darker color and graceful swimming make it easier to spot from the surface than a sea angel. When not swimming, it often curls up on the bottom to rest.